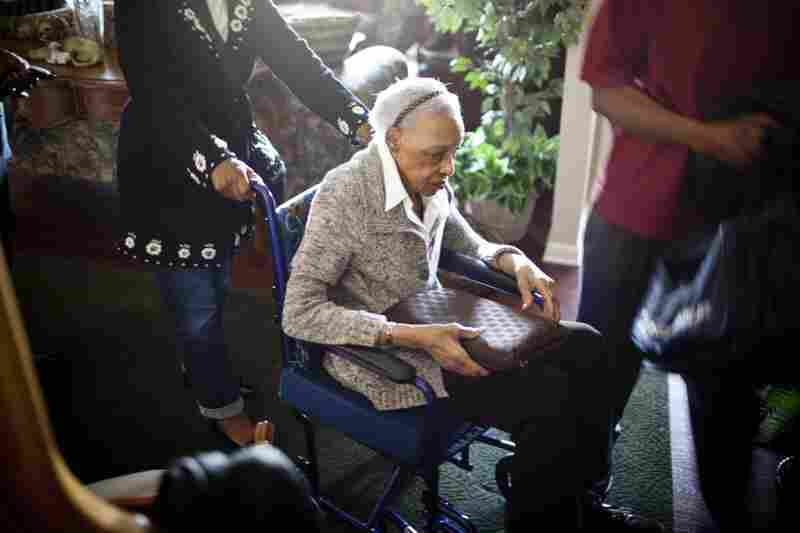 Part 6: Time To Move Grandma: What To Do With Her Home? Depressed home prices make the decision to move an aging relative even more difficult than normal. So what should be done with the house? Try selling in a depressed market? Or rent it until prices perk up? 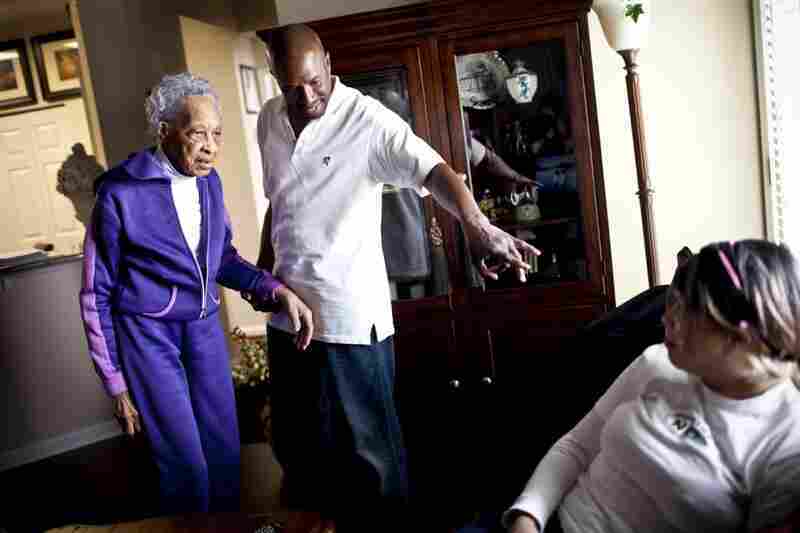 One family weighs a tough choice as it struggles to pay for a grandmother's care. Time To Move Grandma: What To Do With Her Home? Frank Christian asks his mother, Ida, if she recognizes his daughter, Shannon. Ida lived with Frank's family in Virginia from 2001 to 2009. After being diagnosed with dementia, Ida moved in with Frank's sister Geneva, who lives in Maryland. Yolanda Hunter, Geneva's daughter, talks with Frank about Ida's doctor's appointments and upcoming caretaking needs. Frank stands outside his home in Glen Allen, Va., which he co-owned with his mother. The family recently sold the home in order to free up money for Ida's care. 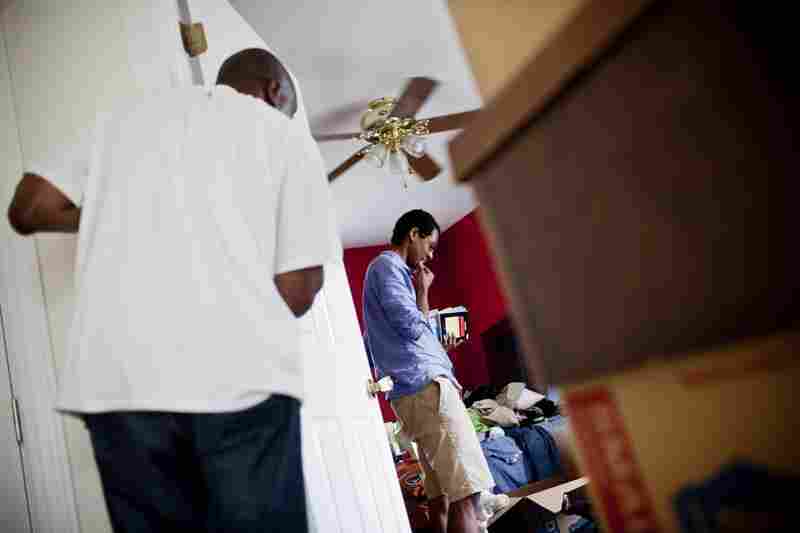 Frank looks on as his son Jonathan, 21, packs his belongings in preparation for their move. "I don't mind the change," Frank says. "I'm a lot like my mother." 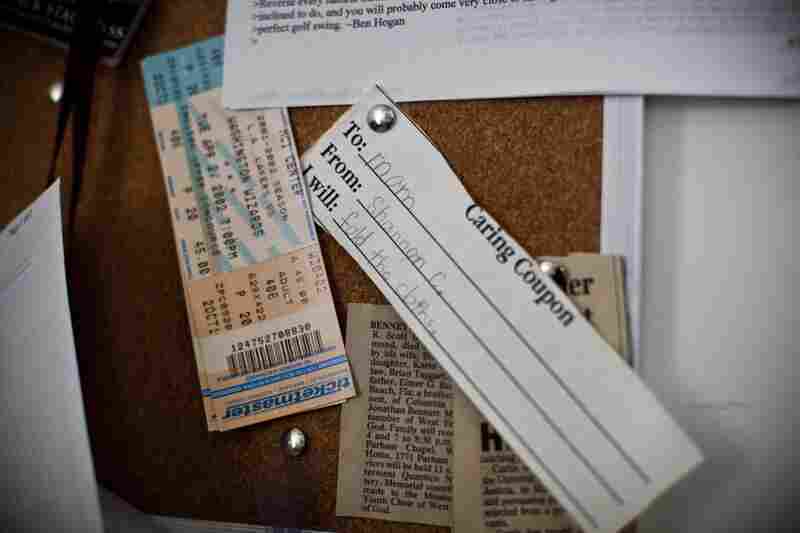 A "caring coupon" given by Shannon to her mother hangs on a bulletin board in Frank's home office. Frank has a laugh with Shannon after finding pictures of himself, taken in 1971, while cleaning out his roll-top desk. 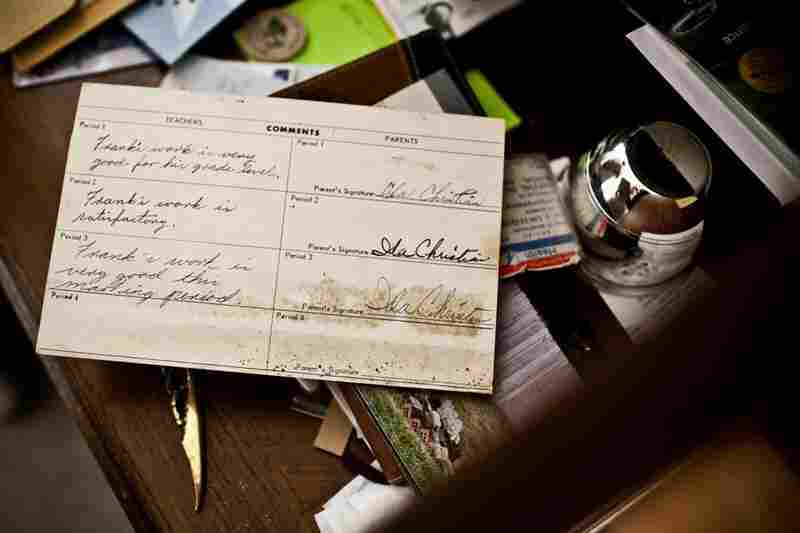 Frank's 1960 second-grade report card states that his work was "very good" and shows Ida's signature in the right-hand column. Jonathan plays Ida's piano, which he says she won in a raffle in 1976. 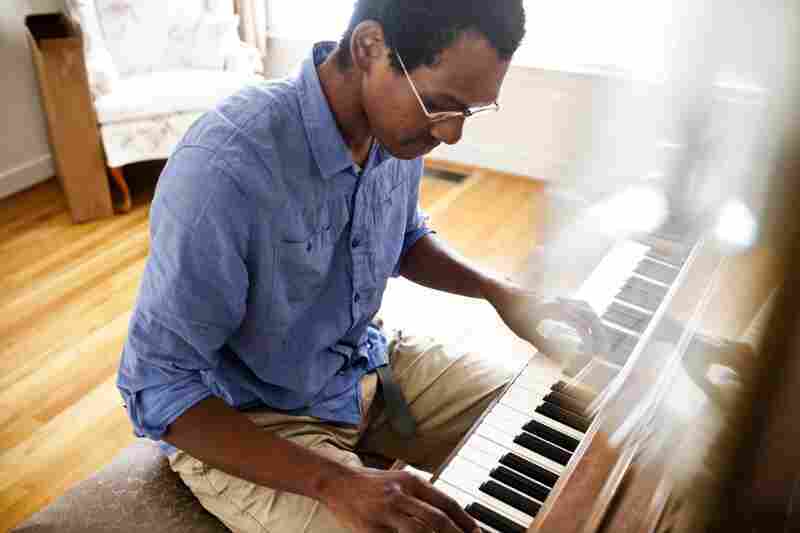 Jonathan remembers Ida playing hymns and folk-type music. "I grew up with Ida," he says. "I used to drive her to church every Sunday. She was always laughing." Frank takes a break from packing in the family's dining room. He says the new homeowner bought their house because of the downstairs en suite bedroom and bathroom. "She is a single mom and will be taking care of her parents," he says. Since 2009, Ida has required full-time care as she fades in and out of awareness. "She was my buddy," says Frank of his mother. "I miss her, because there was always something to laugh about." Making the decision to move a parent out of the homestead can hurt. The house may be full of good ghosts and happy memories. But it also has too many steps and too much lawn to mow. So the time comes to pack up and move on. A decade ago, at least one part of that transition wasn't so tough. When the for-sale sign went up, an eager buyer was likely to show up with a good offer. But today, families are facing a much more difficult real estate environment. Home prices are down more than 30 percent from their peak in 2006, according to the S&P/Case-Shiller 20-City Composite Home Price Index. In 2011 dollars; 2010 figure is a preliminary estimate. "The market's bad," Frank Christian, 58, of Glen Allen, Va., says when discussing his family's dilemma about selling the house he owned along with his mother, Ida Christian, 89. He and his mother are members of one of three families being profiled in an NPR series, Family Matters: The Money Squeeze. The series looks at the financial decisions that are being made in multigenerational households. For the past three years, Ida, whose Alzheimer's disease is worsening, has been living with her daughter, Geneva Hunter, 66. To help pay for her mother's care, Geneva needed her brother Frank to sell the house and get as much cash as possible to help pay for Ida's care. Frank is himself a real estate agent. So he knows the value of living in your own home. But he also knows that a time comes when having a house is too much for an elderly person. At this point, selling "would free up money we could use for her overnight care," he said. The family's situation is common as more people move into advanced old age. About 6 million Americans are now 85 or older — an age when homeownership becomes almost impossible for most. Realtor John Mike, a Re/Max agent in West Palm Beach, Fla., said selling a house can generate cash for hiring help for an elderly person. But too often, he says, adult children dump their parents' houses too quickly at very low prices. When a crisis hits — say, dad dies and mom needs to move in with a child — the family may see the house as a source of immediate cash to help pay for the move and more care. "It's found money," he said. "They don't care if they get $20,000 less than they would" by being patient. This rushed selling has been contributing to low prices in South Florida, he said. Mike said renting out a house to create an immediate monthly stream of cash can be a better option than panicked selling. "I've seen people who have been very happy with renting out the house, and it's better for the neighborhood because the house is occupied," and the home-price comparisons don't get driven down in a rushed sale, he said. But Mike said that while that path may work for some homeowners, too often "people have regrets because the reverse mortgage just delays the inevitable." With home prices still falling and nursing aide costs rising, the cash from the reverse mortgage doesn't go far, and before long, the owner needs to move, he said. In many cases, "that's the house you grew up in," Fodrini-Johnson said. "It's a special place." Because of the intense emotions surrounding a home, the decisions often cause conflicts among siblings. She urges families to communicate respectfully with each other to determine which options — selling, renting or getting a reverse mortgage — might make the most sense. 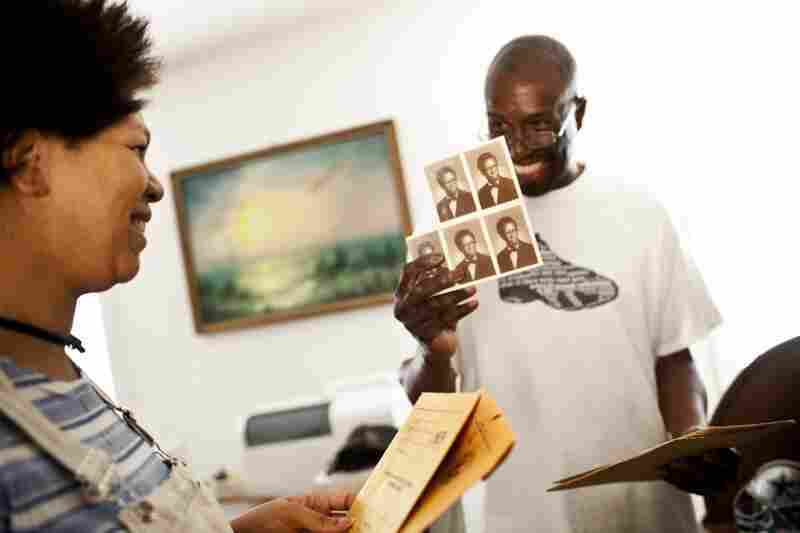 For Frank Christian and his sister Geneva, the matter is now settled. They have just sold the house that Frank shared with mother Ida. The proceeds are being divided up, and Ida's share will go toward her care in Geneva's home. Frank is heading off to an apartment with his family. For Geneva, the sale is a relief. Now she won't have to continue depleting her own savings to pay for her mother's care, and the family will be able to afford an overnight aide to help as her mother's condition worsens. "We're going to need that nurse there to do things that we can't do," she said.